launched his music and singing career with new single 'Sozinho'. a bid to crack the music business. been public knowledge, and he's previously featured in a number of rap videos. He also sang in the official Rio Paralympics song in 2016.
friends. This is my first song, with no composition partner!!!" 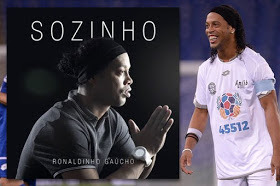 0 Response to "Football Legend Ronaldinho Is Now A Musician As He Releases New Song 'Sozinho'(See Details)"